Last spring, Marvel teased a few major changes for their comic book universe as a result of the fallout from Civil War II. Their Divided We Stand fall promo featured dozens of their popular characters, as well as several new and returning heroes. However, one of the most disturbing aspects of Mike Deodato’s well-rendered hero landscape wasn’t who made the cover, more so who didn’t – in particular, Tony Stark. His true destiny hasn't been revealed yet, but in Tony’s absence, two characters will attempt to fill the Golden Avenger’s void – Victor Von Doom and newcomer 16-year-old Riri Williams. After donning some War Machine-like armor to help out Team Iron Man during Civil War II, Riri finally got her debut in this week’s Invincible Iron Man #1 reboot – and she had some surprise help from none other than Tony Stark. The last few issues before Invincible Iron Man's reboot set up his hand-picked Iron successor, as Tony Stark met Riri and began training her, in spite of her mother’s initial concern about becoming a superhero. After assuaging her mother’s fears the best he could, the pair had only began to train together before tragedy struck during Civil War II, removing Iron Man from the equation and leaving a somewhat unprepared young woman with massive iron shoes to fill. Brian Michael Bendis’s heartfelt and powerful story carries Riri into her first solo arc, along with Stefano Caselli’s gorgeous artwork and Marte Gracia's deft color work. Along the way, we get to know more about the young woman with one of the most difficult tasks in the MU – stepping into Tony Stark’s shoes. Her young life has already witnessed a great deal of personal tragedy, something which helps readers understand who Riri is and her childhood growing up in Chicago. Nothing can truly prepare her for hero duties, though, or her first foe (occasional X-Men baddie Animax). When the young Iron Woman stumbles across her, the mutant menace has just busted herself out of jail in Wyoming and is raising Cain with a horde of monsters created from her own DNA (foreshadowing for Monsters Unleashed?). After some technical difficulties, she manages to dispense with her first solo villain, but realizes her tech is sadly underpowered thanks to a lack of real superhero resources. Frustrated, she heads home to figure out a way to maximize her computational capabilities, until a package arrives at her mom’s house in the hands of an officious courier. Upon pushing the jolly, candy-like button, she’s greeted with the same artificial intelligence hologram of Tony Stark which discouraged Victor Von Doom from 'borrowing' his super-armor in Infamous Iron Man #1. 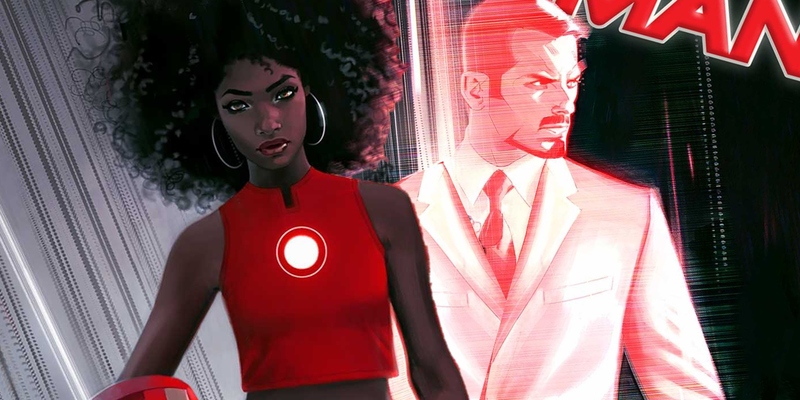 It seems that, no matter what happened to Tony Stark during Civil War II, some part of him lives on and will still be flying high as Iron Man, at least vicariously through Riri Williams. Tony apparently managed to find a way to continue his good work as the Golden Avenger even after his life (presumably) ended. Of course, ‘I thought you were dead’ is one of the most frequently uttered phrases around the comic book multiverse. At the same time, Bendis' method of keeping Tony around, as a snarky computer sidekick, is a great way to transition Riri into her new role in the MU. Criticisms aside, Bendis spins a tight yarn in Invincible Iron Man #1, one which jogs between the past and present fairly seamlessly. While Civil War II may have had its problems, the Marvel scribe is at his best with smaller, more personalized tales (as evident in Jessica Jones). Along with Caselli’s crisp renditions and gorgeous facial expressions, Bendis' nuanced moments are what sticks in the mind, despite the enjoyable monster-bashing sequences. Even those sick of Marvel status quo change-ups ought to give the Invincible Iron Man reboot, and Riri Williams, a shot. They may find themselves pleasantly surprised. Next: Does the Civil War II Finale Seal Iron Man's Fate? Invincible Iron Man #1 is currently available online and in print.